I have a lot to be thankful for. My wonderful wife will share her birthday with Thanksgiving day. Happy Birthday!!! We will enjoy a wonderful meal with family and friends. We all will eat well and will catch up on what has happened since the last Thanksgiving. We will watch football and will wish we did not eat as much as we did. When I do my personal reflection of thanks it will weigh heavily on thanking those in the free press who have done their job of keeping them honest. I am not talking on Anderson Cooper and CNN. They refused to investigate the Bloom Energy BLOOMDOGGLE. I will be thinking of three folks at NBC Bay Area. They are the reporter, the producer, and the cameraman who collectively worked on their report on the greenwashing by Bloom. I will thank them. I know the NBC Investigates report had a hard time to see the air as Bloom and their cronies brought a lot of pressure to suppress the report. I know the report was edited by legal folks at NBC as Bloom is a power company with powerful shareholders, officers, and directors. But these three brave press people had the conviction to air a fair and balanced report. Bloom’s spokespeople have subsequently called the report silly, a reporter looking for a story, and also Hodge Podge. Bloom has tried to put their green spin on the report and is busy covering up. I will also thank Breitbart for having the guts to post the sulfur story. They did so today and here is the link. But Bloom has blinked and has formally and forever changed their specification sheet from their greenwashed lie of 773 pounds of CO2 per megawatt hour of electricity from their unreliable, dirty, and prohibitively expensive Bloom Coffins. The 773 greenwashed lie started in March 2010 with emails from a Bloom engineer to me. For four years and seven months they stuck with their 773 pounds of CO2 per mwh, until they changed their specification sheet a few weeks ago. All the time they simply lied and greenwashed their products GHG emissions while grabbing hundreds of million of dollars of public funds. The NBC report could have covered the solid waste with sulfur as I did explain this to NBC Investigates, but NBC focused on greenhouse gas emissions. I do hope NBC does a follow up report on the sulfur containing solid waste. I happen to think the hidden sulfur waste is cause for criminal action against the major shareholders, officers, and directors of Bloom Energy as well as politicians and civil servants who have hidden the waste. I will also reflect on my lack of thanks for the corrupt representation Mr. Huffman and Mr. Levine have given me as a citizen in Northern California. My Congressman and my Assemblyman are under the thumb of Al Gore and his cronies. These two sellouts represent what is the worst in America. These two don’t blink they just want power whether or not it has high carbon footprint or not. They want power whether it has associated solid waste with sulfur or not. They just want to move up in their party apparatus and look for bigger jobs and more power. Huffman wants to be a US Senator when either Feinstein or Boxer vacates their Senate seats. Levine wants Huffman’s “job” of US Congressman. I just want the rule of law and I want to see the people who brought the BLOOMDOGGLE and aided and abetted in the BLOOMDOGGLE face the justice we deserve. Remember these are crimes against nature and humanity. These are crimes of a Nuremberg level. Last Thanksgiving, I had no clue Congressman Huffman would call me with his excuse of the CLECA defense in the BLOOMDOGGLE. Last Thanksgiving, I had no clue that three brave souls at NBC Channel 3 would have the guts, smarts, and fortitude to do their report. Last Thanksgiving, I did not know that Collin O’Mara the head of the Delaware DNREC and a secretary in Governor Markell’s cabinet would resign and hide in the wilderness. Last Thanksgiving, I had no clue that I would get this much traction in exposing the BLOOMDOGGLE. Who knows by next Thanksgiving Anderson Cooper and CNN may be keeping Al Gore, John Doerr, and Colin Powell really honest. Last thanksgiving I did know that KIOR with the war criminal Condi Rice and the thermodynamic joker Vinod Khosla would be bankrupt by this Thanksgiving. They are!!!! There is some talk that President Obama may nominate Colin Powell for Secretary of Defense, I do hope he in nominated so that a US Senator can ask him at his confirmation hearing what role he played in the BLOOMDOGGLE while a Board Member of Bloom Energy. Remember when the onion is fully peeled the BLOOMDOGGLE is Solyndra times four. No Chinese to blame at Bloom. There are just greedy Canadians, New Zealanders, Germans, Swiss, Indians, and of course Americans. When the onion is fully peeled and Al Gore is stark naked we will all realize he is the least deserving of a Nobel Peace prize for his oratory and writing on greenhouse gasses. Mr. Gore, actions speak far more loudly than words and your greedy actions for money through Bloom Energy have caused untold environmental harm and has cost taxpayers and ratepayers over a half billion dollars so far. Mr. Huffman and Mr. Levine are well suited to be your BFFs. BFF equals Bring Federal Funds!!! 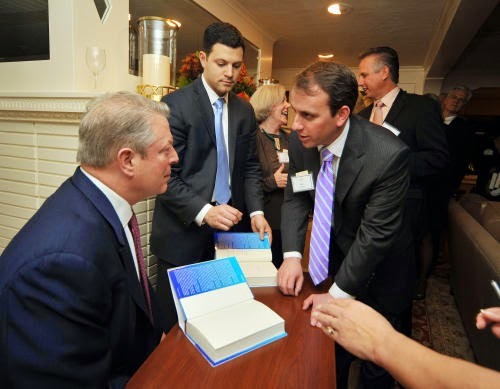 The photo is of Assemblyman Levine with Al Gore at a book signing in San Rafael California. The book like the two men is a joke. Have a great Thanksgiving. The Nation also thanks you for taking the time to expose the vast waste of tax dollars on uneconomical and impractical renewable energy products. Happy thanksgiving. The Onion I have peeled will add nicely to to the turkey gravy. The Turkeys in the Department of Entropy are still enrolling in Thermo 101. Sad but true and Moniz is just another Chu except with a smile.